Welcome to the first CD release by TNT Records. With a little help from our friends at “Audionics” - probably THE premium label when it comes to rare recordings in best possible sound - we decided to “dive deep” into one of the most well-known concert tours Elvis ever did. Much has been written about “Tour Number 14” (May 30 – June 10, 1975) so we don’t want to bother you too much with even “more” information. On this brandnew double-cd set (Release Date: December 10, 2013) you are going to hear both concerts Elvis did right in the middle of the tour. 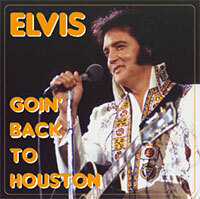 Concerts number 9 and 10 took place in Houston, Texas. Although the reporters from the local papers “Houston Chronicle” (Dale Adamson) and “The Houston Post” (Bob Claypool) were not too happy with the way Elvis presented himself (you will see their original newspaper articles pictured in the 16-page booklet that comes with the cd) the excited crowd at the Hofheinz Pavilion in Houston still loved Elvis as they did since the 1950’s. “Audionics” helped us to make a significant improvement in the sound of the two soundboard recordings. If you have missed the show´s first releases from more than 10 years ago or if you want to owe them in better sound than before plus exactly the way they were recorded (without the standard “2001 Theme / See See Rider” opening) you should not miss this great new double cd! Ask your local dealer for it, he should have it right in time before Christmas for you!